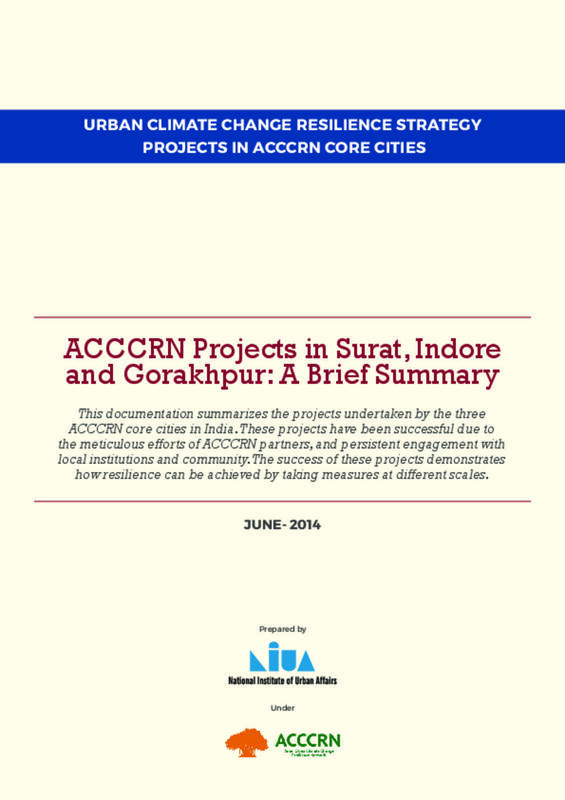 This documentation summarizes the projects undertaken by the three ACCCRN core cities in India: Surat, Indore and Gorakhpur. In Surat, formation of Climate Change Trust, setting up of End to End warning system and formation of Urban health and Climate Resilience Centre (UHCRC) are some of the Climate resilient measures disscued. In Indore some of the projects were: urban and peri urban lake restoration, setting up of vector borne disease surveillance, usage of cool and reflective roofs and establishment of response systems and conjunctive water management systems. While in Gorakhpur the projects involved were promotion of peri urban agriculture, building climate resilient houses and establishing micro level planning with community involvement. These projects have been successful due to the meticulous efforts of ACCCRN partners, and persistent engagement with local institutions and community. The success of these projects demonstrates how resilience can be achieved by taking measures at different scales.